To prepare rémoulade, combine first 9 ingredients in a bowl; cover and chill. To prepare croquettes, combine 1/3 cup yogurt, 1 tablespoon mustard, and eggs in a bowl. This is called the yogurt mixture. Set aside. Heat a nonstick skillet over medium-high heat. Coat pan with cooking spray. Add the chopped onion and celery; cook 4 minutes or until tender. Cool slightly. 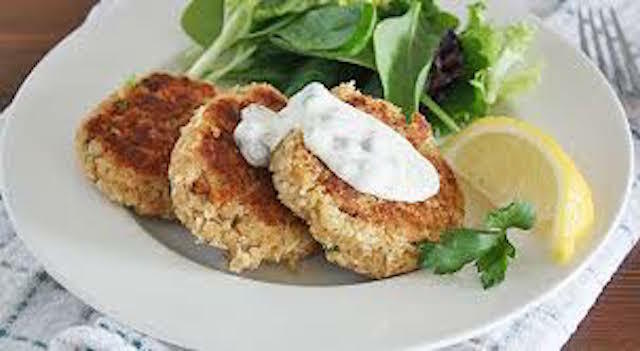 Combine onion mixture, yogurt mixture, 1/2 cup Panko crumbs, 1/4 teaspoon dried tarragon, 1/8 teaspoon pepper, and salmon in a bowl; toss gently. Cover and chill 10 minutes. Divide salmon mixture into 8 equal portions, shaping each into a 1/2-inch-thick patty. Coat patties evenly with remaining 1/2 cup Panko crumbs. Cover and chill 20 minutes. Do not skip this step or the croquettes will not hold together when you turn them. Melt butter in a large nonstick skillet over medium-high heat. Add croquetts; reduce heat to medium. Cook 4 minutes on each side or until lightly browned. Serve croquettes with remoulade sauce. Garnish with fresh tarragon.